Showing items in category Grenada, sorted by newest listed first. GRENADA - 1947 multi franked registered cover to UK with 10/- (SG 163d) used at GPO/GRENADA. 1947 (OC.15.) 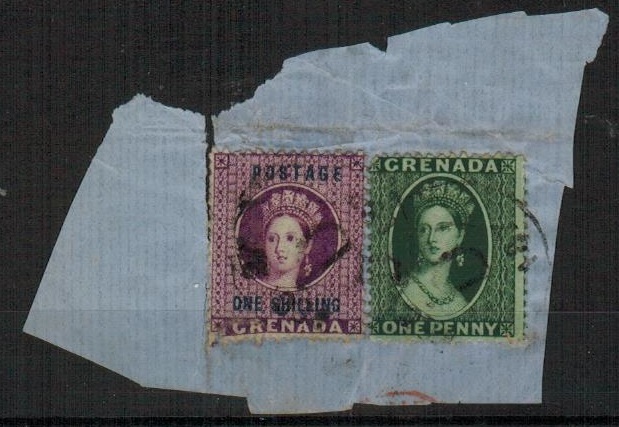 long registered cover addressed to UK bearing 1/4d, 1/2d, 1 1/2d, 2 1/2d, 3d pair, 2/- and 10/- values tied GPO/GRENADA BWI cds. The 10/- being the slate-blue and carmine (wide frame -perf 14) issue (SG 163d). GRENADA - 1904 1/2d rate postcard use to France used at GRENVILLE. 1904 (AU.24.) 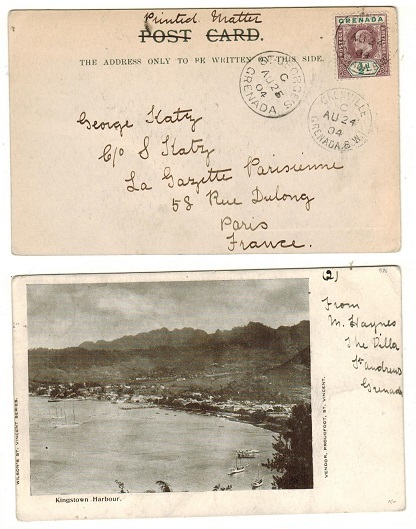 use of picture postcard addressed to France depicting 'Kingstown Harbour of St.Vincent' bearing 1/2d adhesive tied GRENVILLE/GRENADA. 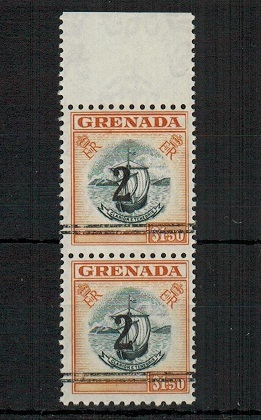 GRENADA - 1934 series on 'GB' 4 1/2d puce RPSE to UK used at GPO/GRENADA. 1935 (FE.1.) 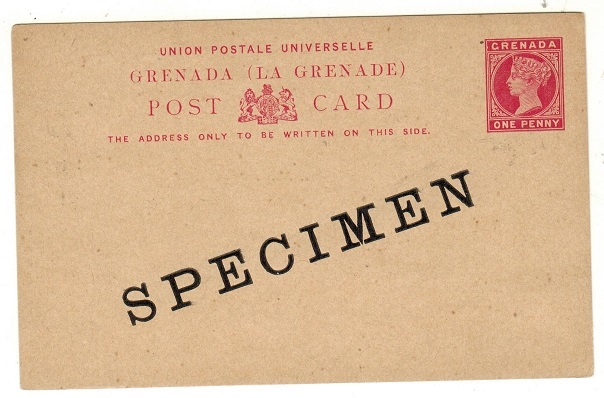 use of GB (un-overprinted) 4 1/2d puce registered postal stationery envelope (size H) addressed to UK bearing the complete set of 10 of the 1934 pictorial definitive series (SG 135-44) tied GPO/GRENADA. A scarce an unusual use of this GB stationery in Grenada. GRENADA - 1873 1d blue green used strip of three. SG 11. 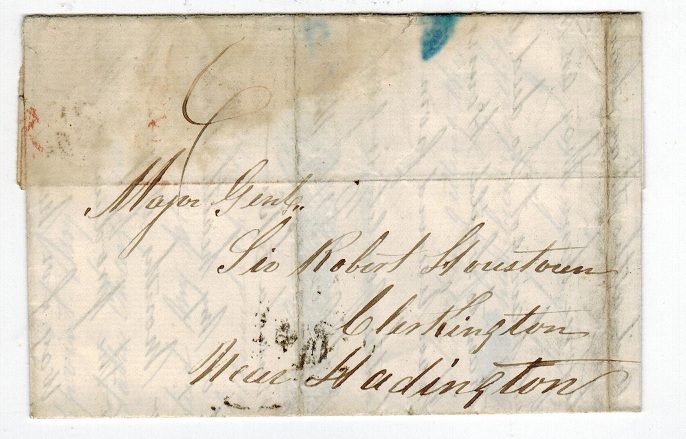 1873 1d blue-green 'Chalon head' adhesive in a fine horizontal strip of three of the larger star watermark (sideways) cancelled by 'A15' duplex's. SG 11. GRENADA - 1943 2d rate 'I.S.S.' censor postcard use to UK. A rare Imperial Censorship. 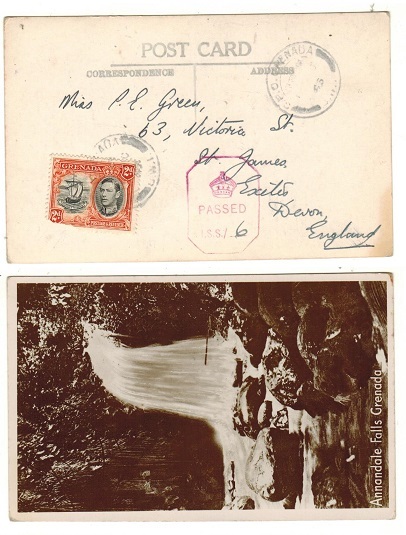 1943 postcard use to UK depicting 'Annandale Falls-Grenada' bearing 2d adhesive tied by GPO GRENADA cds and struck by octagonal crowned PASSED/ I.S.S./….. 'Imperial Censorship' handstamp in red ink with '6' inserted in manuscript. Miller type H6. Very rare. 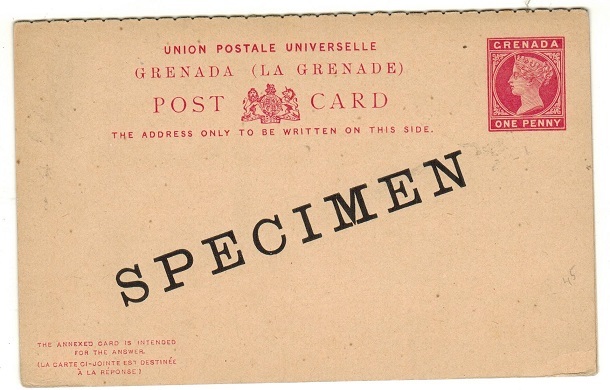 GRENADA - 1937 5/- rate registered cover to UK. 1937 (NO.6.) 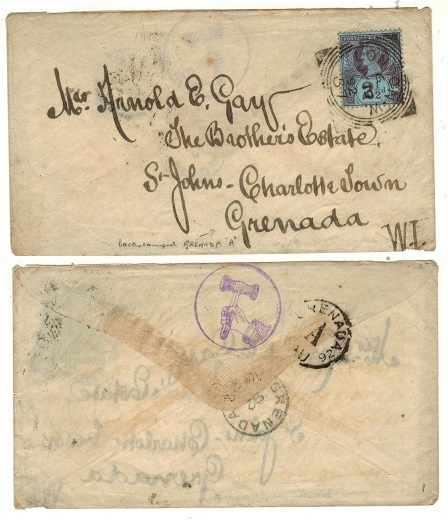 registered long commercial cover addressed to UK bearing the 'GV' 5/- black and violet (SG 144) tied by GPO GRENADA/BWI cds. A scarce top value on cover. 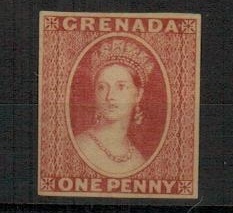 GRENADA - 1881 1d light blue PSC unused. H&G 1. 1881 1d light blue on cream postal stationery postcard in fine unused condition but with very light corner shadow at lower right. H&G 1. GRENADA - 1861 1d IMPERFORATE PLATE PROOF in rose-red. 1861 1d (SG type 1) chalon head IMPERFORATE PLATE PROOF printed in rose-red on ungummed woved paper. GRENADA - 1870 piece bearing 1d green and 'One Shilling' Chalon heads cancelled by 'D' cancel. 1870 piece bearing 1d green and 'One Shilling' deep mauve 'Chalon Head' adhesives cancelled by 'D' parish cancel. GRENADA - 1870 piece bearing a fine pair of the 6d 'Chalon Head' tied by 'A 15' duplex. 1870 piece bearing a fine pair of the 6d 'Chalon Head' adhesive tied by 'A 15' duplex. 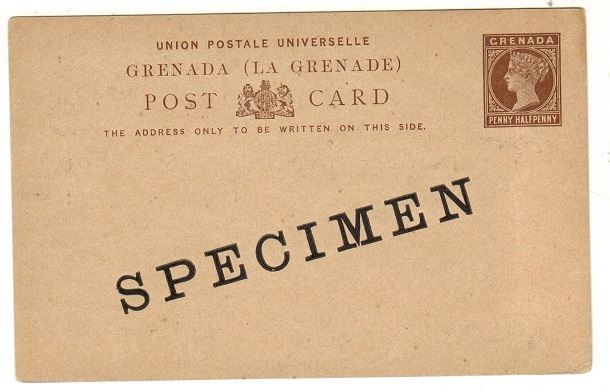 GRENADA - 1946 10/- on local cover used at GPO GRENADA. 1946 (FE.20.) 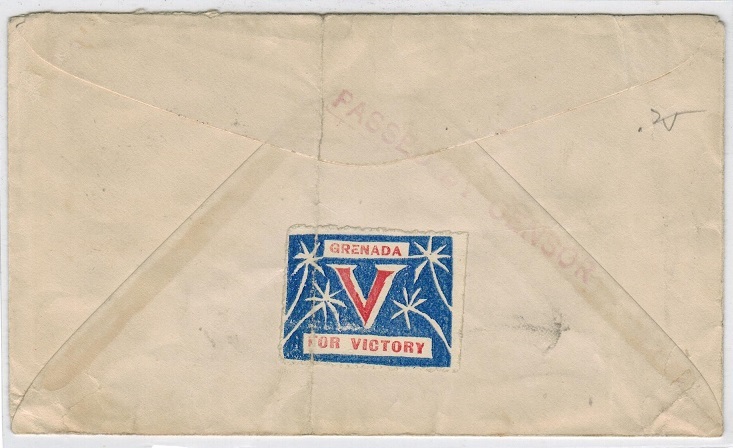 cover addressed locally and bearing 10/- adhesive tied by GPO GRENADA/BWI cds. (Perf 14/Narrow frame). Stated to be steel blue and bright carmine. 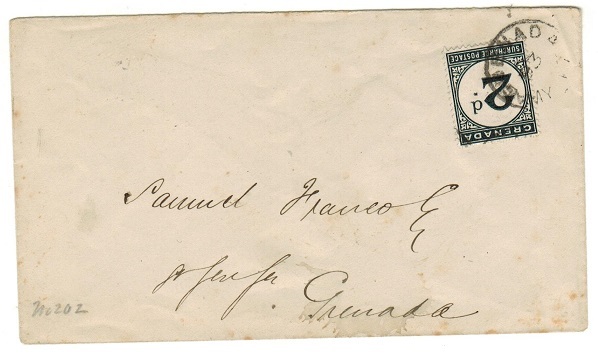 GRENADA - 1856 stampless cover to UK with double arc GRENADA b/s. 1856 (FE.9.) 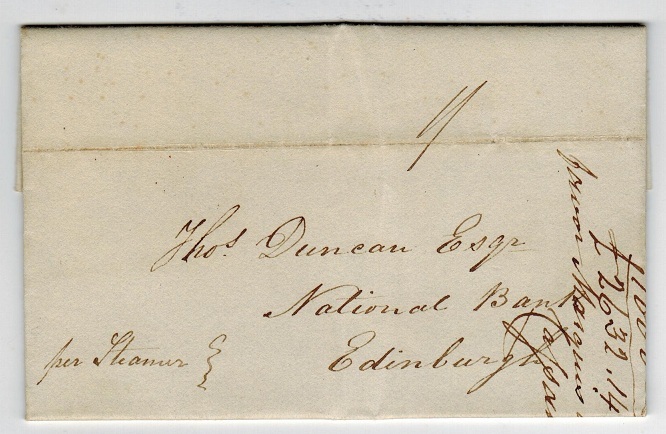 stampless cover addressed to UK rated '6' in manuscript and with double arc GRENADA b/s. 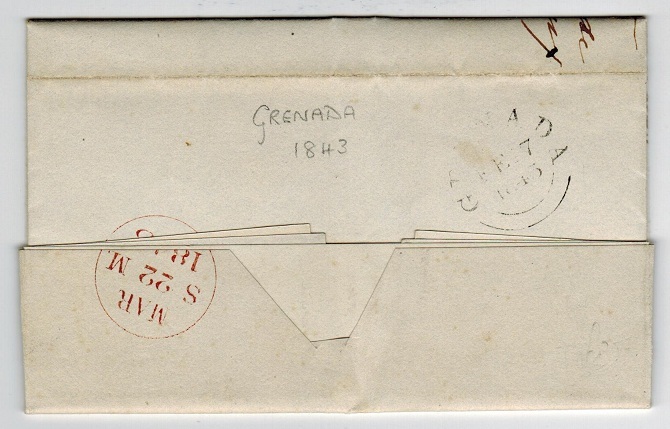 GRENADA - 1892 inward cover from UK with GRENADA/A parish arrival b/s. 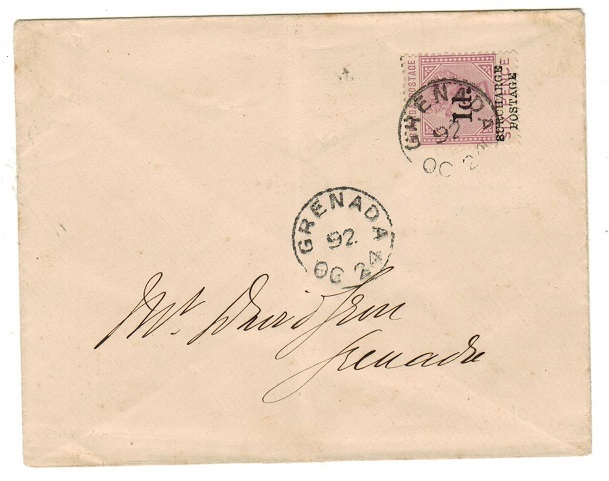 1892 inward cover from UK with GRENADA/A parish arrival b/s. A scarce inward cover. GRENADA - 1951 6c ultramarine RPSE (size F) unused SPECIMEN. Unlisted by H&G. 1951 6c ultramarine on buff registered postal stationery envelope (size F) in unused condition with SPECIMEN applied diagonally in black on front. Unlisted in this size by H&G. GRENADA - 1886 1d carmine on buff PSC unused SPECIMEN. H&G 6a. 1886 1d carmine on buff postal stationery postcard (3mm setting) in unused condition with SPECIMEN applied diagonally in black. H&G 6a. GRENADA - 1886 1d + 1d carmine on buff PSRC unused SPECIMEN. H&G 9. 1886 1d + 1d carmine on buff postal stationery reply postcard in unused condition with SPECIMEN applied diagonally in black. H&G 9. GRENADA - 1886 1 1/2d dark brown on buff PSCunused SPECIMEN. H&G 7. 1886 1 1/2d dark brown on buff postal stationery postcard in unused condition with SPECIMEN applied diagonally in black. H&G 7. GRENADA - 1886 1 1/2d + 1 1/2d dark brown on buff PSRC unused SPECIMEN. H&G 10. 1886 1 1/2d + 1 1/2d dark brown on buff postal stationery reply postcard in unused condition with SPECIMEN applied diagonally in black. H&G 10. 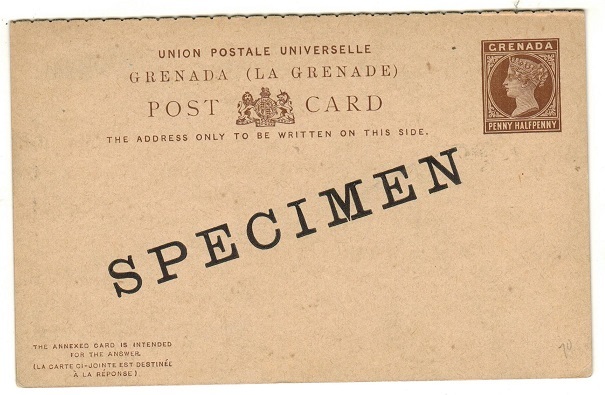 GRENADA - 1883 4d rate entire addressed to UK. 1883 (OC.08) use of entire addressed to UK marked 'Per Mail' and bearing 4d greyish slate adhesive (SG 33) tied by single ringed A/GRENANA cds. GRENADA - 1943 3 1/2d rate censored cover to USA. 1943 (SEP.25.) 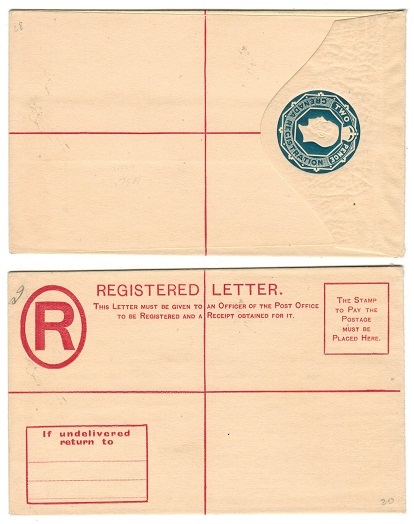 commercial cover addressed to USA bearing 1/2d (corner fault) and 3d adhesives tied GPO GRENADA/BWI with black on cream P.C.90/OPENED BY EXAMINER label at left with 'ISS/44' inserted in black manuscript. Little type L8. Censor 44 being unrecorded. GRENADA - 1884 3d lilac and green 'REVENUE' adhesive unmounted mint with INVERTED WATERMARK. 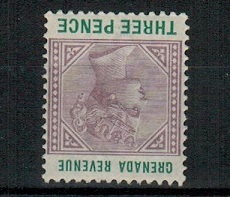 1884 3d green and lilac 'REVENUE' adhesive in very fine unmounted mint condition with the variety WATERMARK INVERTED. Barefoot and Hall 25. GRENADA - 1955 $1.50 'REVENUE' mint pair with TWO DIFFERENT 2 overprints applied. 1955 $1.50 black and orange REVENUE adhesive in a fine mint top marginal vertical pair showing the TWO TYPES OF 2 surcharge. These stamps were issued for fiscal use although they are known used. (See SG footnote under SG 204). GRENADA - 1942 1 1/2d local rate cover with 'TOO LATE' h/s applied. 1942 (AU.20.) local cover to Couyave bearing 1 1/2d adhesive tied GPO GRENADA/BWI and struck at lower left by scarce TOO LATE handstamp. COUYAVE arrival b/s. GRENADA - 1953 2d rate censored postcard use to UK. 1943 (AU.24.) use of coloured picture postcard addressed to UK depicting 'Lake Grand Etang, Grenada' bearing eight examples of the KGVI 1/4d brown adhesive (SG 152) tied by GPO GRENADA/BWI cds with violet crowned circular PASSED BY CENSOR/No./8999 censor h/s applied on arrival. An unusal censor use and a nice use of these farthing stamps to make up a 2d rate. GRENADA - 1955 $1.50 'REVENUE' U/M vertical pair with '2' applied in black. 1955 $1.50 black and brown orange adhesive (SG 203) in a fine unmounted mint marginal pair overprinted '2' in black. Noted in the SG footnote as having been issued for revenue purposes. GRENADA - 1955 $1.50 'REVENUE' used plus 2 U/M pairs with differing '2' overprints. 1955 $1.50 black and brown orange adhesive (SG 203) in two fine unmounted mint marginal pairs each overprinted '2' in black but of differing types. Also a further example used on piece. Noted in the SG footnote as having been issued for revenue purposes although accepting that some had passed for postage through the PO authorities. 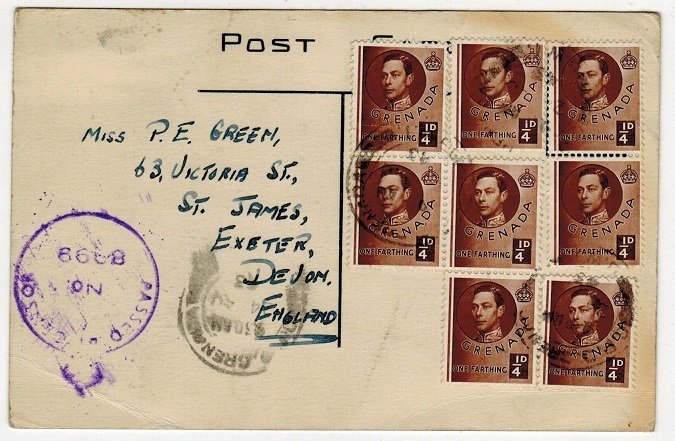 GRENADA - 1936 3d rate 'S.S.ORANGE' maritime cover to UK. 1936 (JY.24.) cover addressed to UK bearing GV 3d adhesive tied by boxed K.N.S.M./SS ORANGE maritime h/s with PAQUEBOT/POSTED AT SEA/RECEIVED/DOVER h/s below. 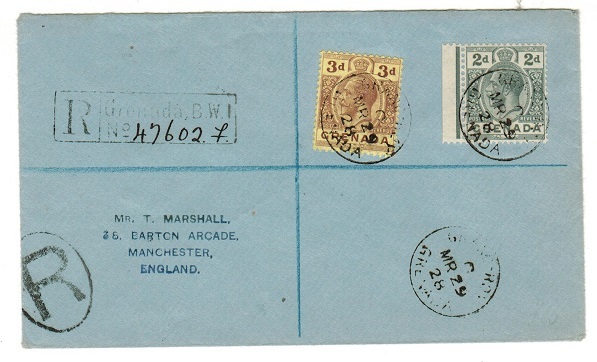 GRENADA - 1931 1/2d rate 'M.S.COLUMBIA' maritime cover to UK. 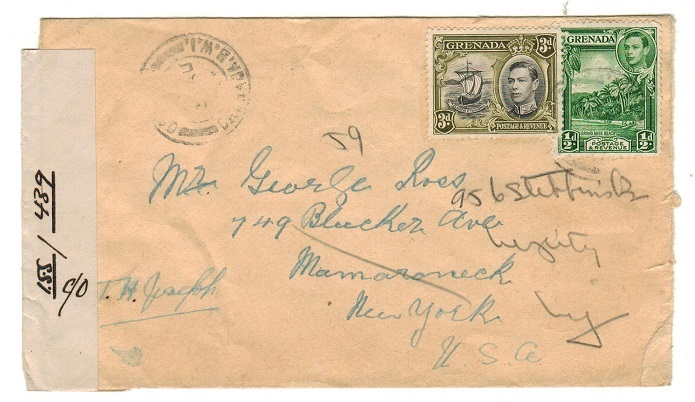 1931 cover addressed to UK bearing 1/2d green adhesive tied by violet straight lined M.S.COLUMBIA maritime handstamp and with LIMON/COSTA RICA transit b/s dated MAR.9.1931. 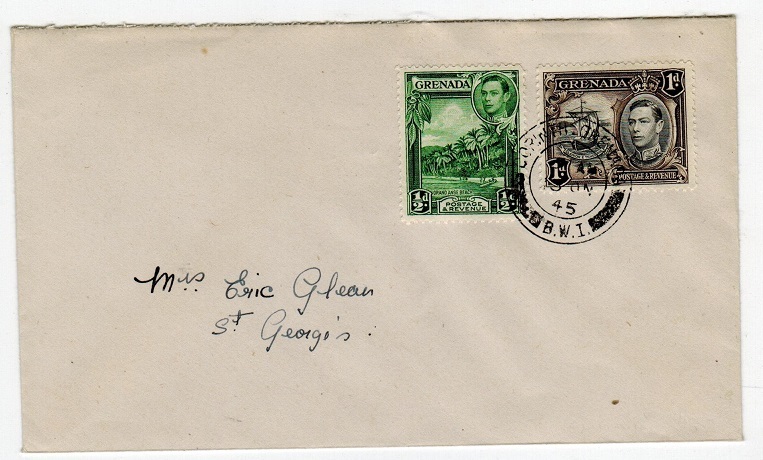 GRENADA - 1939 registered 'Coronation' cover to UK used at COUYAVE. 1937 (MY.19.) registered cover to UK bearing the 'Coronation' trio tied by COUYAVE/GRENADA cds's. GRENADA - 1952 12c red-violet postal stationery air letters mint and cto. H&G 2. 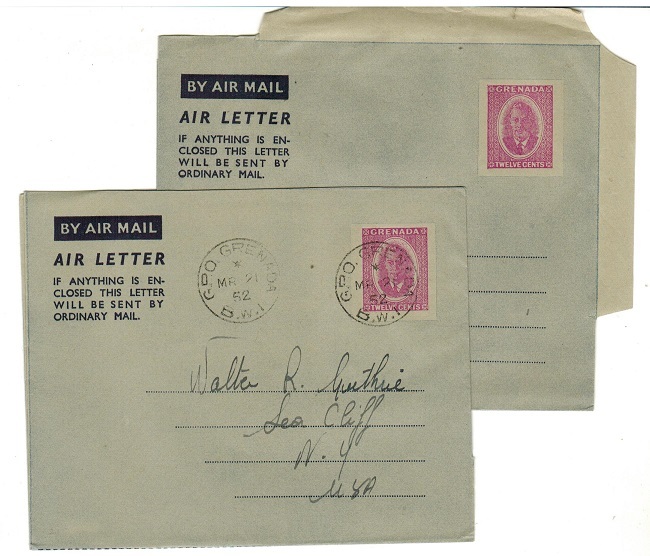 1952 12c red-violet on greyish paper postal stationery air letters. One unused the other 'cto'd' to USA and cancelled GRENADA/BWI and dated MR.2.52. Probably the date of issue. H&G 2. GRENADA - 1953 12c red-violet postal stationery air letters mint and cto. H&G 3. 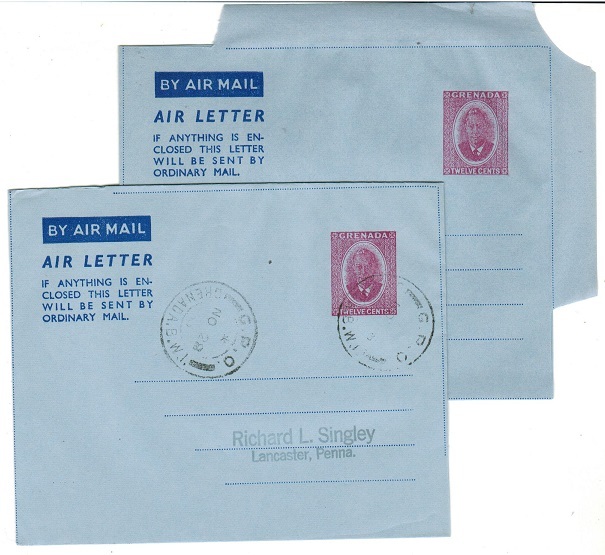 1953 12c red-violet on light blue postal stationery air letters. One unused the other 'cto'd' to USA and cancelled GRENADA/BWI and dated NO.28.53. Probably the date of issue. H&G 3. GRENADA - 1953 7c ultramarine postal stationery air letters mint and cto. H&G 4. 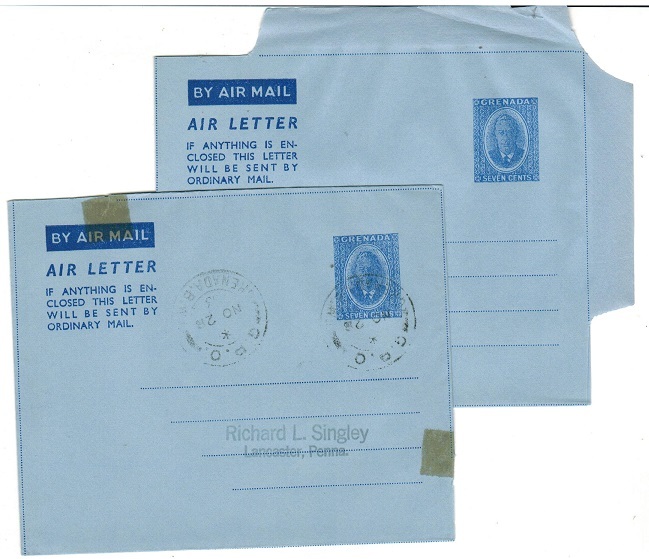 1953 7c ultramarine on light blue postal stationery air letters. One unused the other 'cto'd' to USA (sellotape marks) and cancelled GRENADA/BWI and dated NO.28.53. Probably the date of issue. H&G 4. 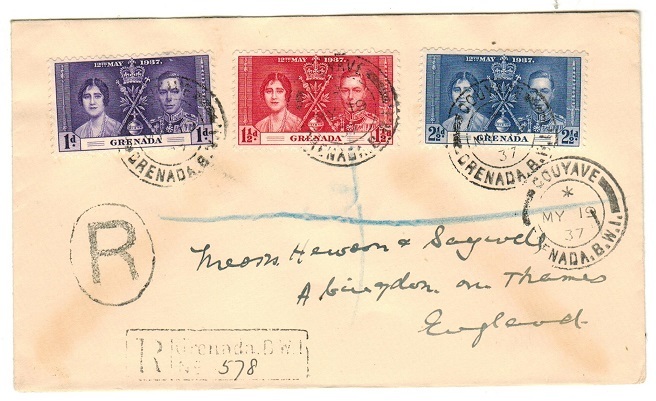 GRENADA - 1928 5d rate registered cover to UK used at GRAND ROY. 1928 (MR.29.) registered cover to UK bearing 2d and 3d adhesives tied by s/r GRAND ROY/ GRENADA cds's. 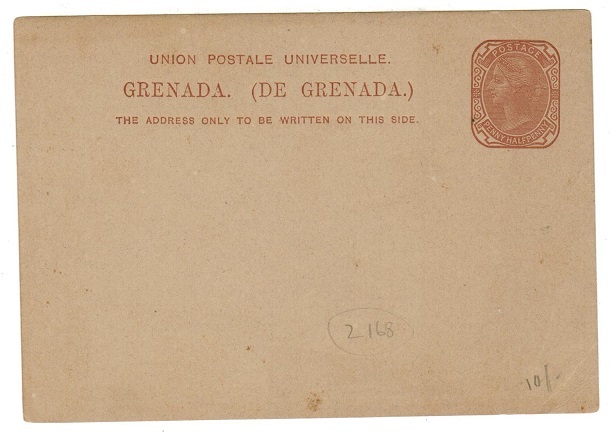 GRENADA - 1893 local unstamped cover with 3d 'Postage Due' added. 1893 (JU.26.) 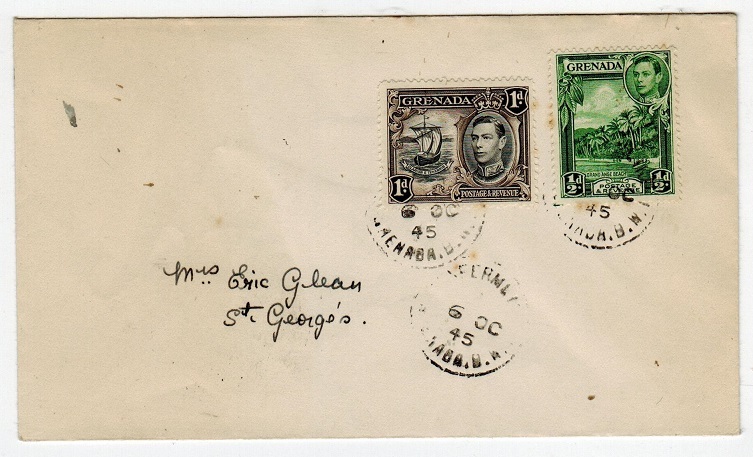 local unstamped cover to St.Georges bearing 3d black 'Postage Due' (SG D3) applied and cancelled by s/r GRENADA cds. 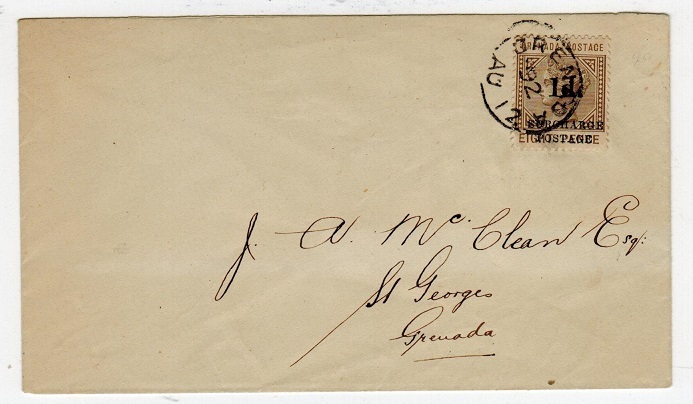 GRENADA - 1893 local unstamped cover with 2d 'Postage Due' added. 1893 (MY.17.) 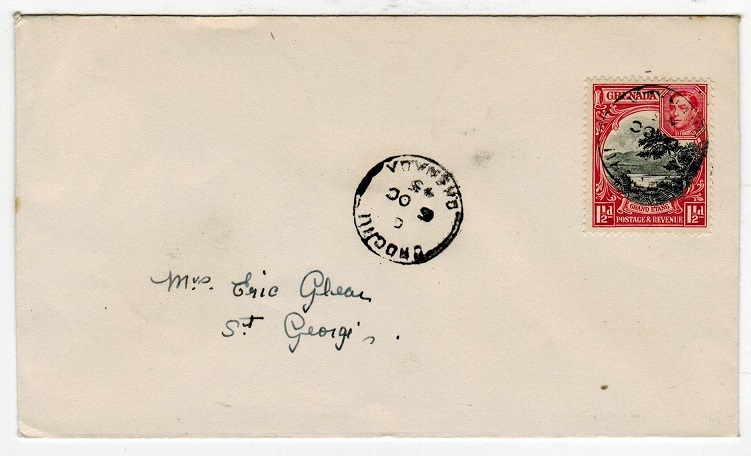 local unstamped cover to St.Georges bearing 2d black 'Postage Due' (SG D3) applied and cancelled by s/r GRENADA cds. GRENADA - 1944 'I.S.S./439' censor cover to USA. 1944 (AU.3.) cover addressed to USA bearing 1/2d and 3d adhesives tied by light GOUYAVE/ GRENADA cds with black on white P.C.90/OPENED BY EXAMINER/-/ - censor label (Little type L8) with 'I.S.S. 439' inserted in manuscript. This censor number not being recorded. 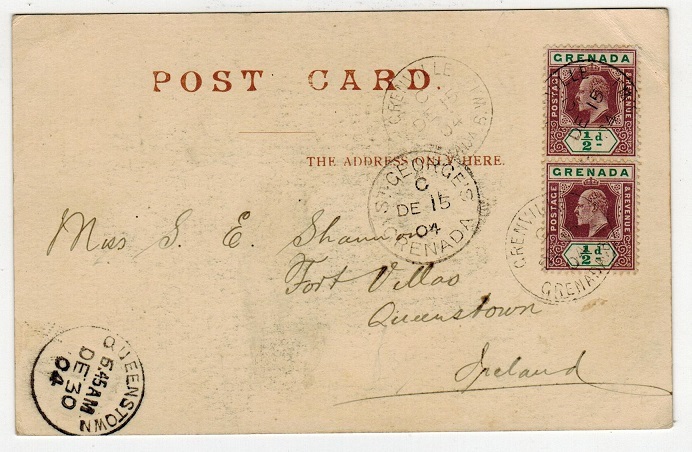 GRENADA - 1894 2 1/2d rate cover to Ireland used at ST.GEORGES. 1894 (NO.29.) 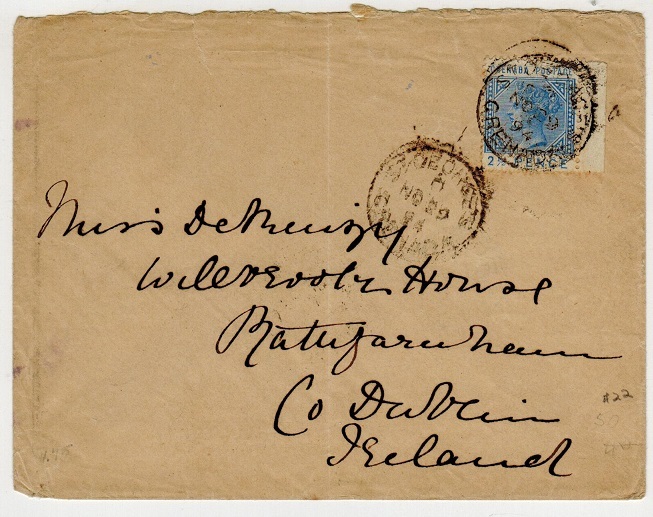 cover addressed to Ireland bearing 2 1/2d adhesive (SG 32) tied by ST/GEORGES/ GRENADA cds with additional strike below and struck on the reverse by H & K PACKET b/s. GRENADA - 1942 illustrated 'Firestone' censored cover to USA. 1942 (AU.1.) 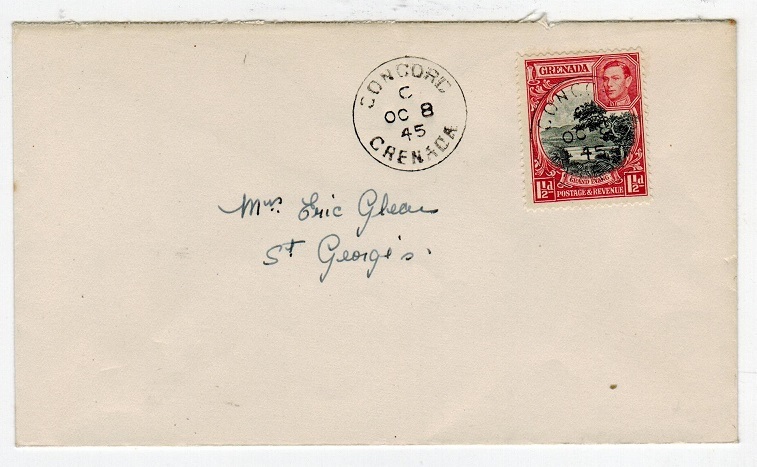 commercial illustrated 'Firestone' envelope addressed to USA bearing 2 1/2d and 1/- adhesives tied ST.GEORGES/GRENADA with black on white P.C.90/OPENED BY EXAMINER/ SS/ local censor label at left edge with '5' inserted in red manuscript. Miller type L2. 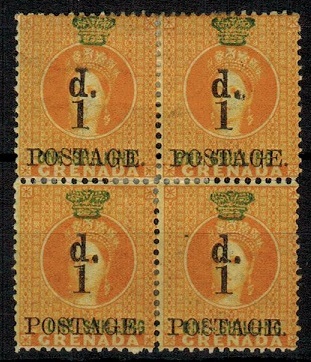 GRENADA - 1883 1d on 1/- orange surcharge mint block of four. SG 38. 1883 1d black on 1/- orange surcharged adhesive with additional 'Postage' overprint applied in a fine mint block of four. Scarce multiple. SG 38. GRENADA - 1892 local cover with 1d on 6d 'Surcharged Postage' adhesive tied GRENADA. 1892 (OC.24.) local cover bearing the 1d on 6d mauve 'Surcharged Postage' issue (SG D4) tied by GRENADA s/r cds. A scarcer use of this postage due as a postage stamp. GRENADA - 1938 'M/V STELLA POLARIS' maritime use of postcard to USA. 1938 (circa) use of picture postcard addressed to USA depicting 'Nutmegs-Grenada' bearing KGVI 2d adhesive (uncancelled) but with red oval POSTED AT SEA ON THE/B&N LINE/ m/s STELLA POLARIS maritime h/s alongside. 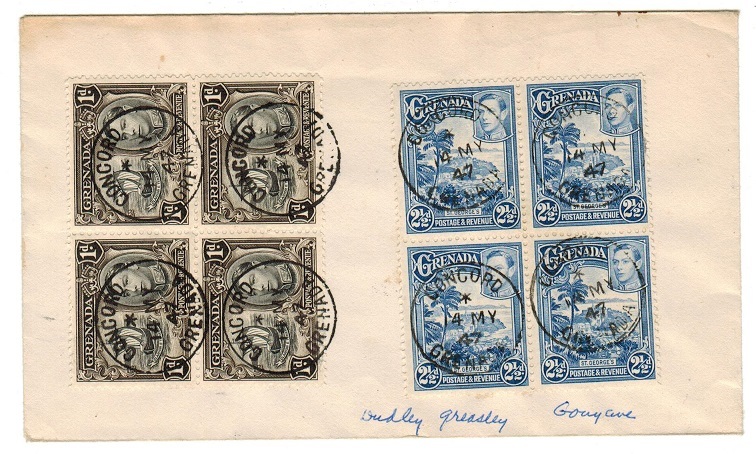 GRENADA - 1929 3d dark blue RPSE uprated to USA. H&G 7a. 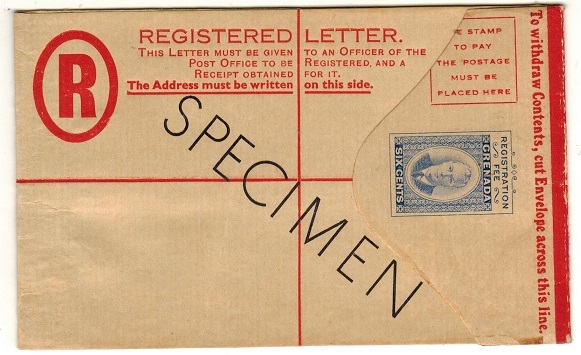 1929 3d dark blue on cream registered postal stationery envelope (size G) addressed to USA and bearing additional 1 1/2d and 2 1/2d adhesives tied GPO.GRENADA and dated 7.AP.34. H&G 7a. 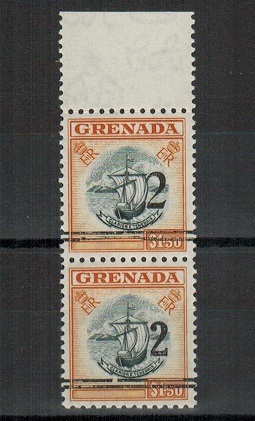 GRENADA - 1920 2d dark blue RPSE unused. H&G 5. 1920 2d dark blue on cream registered postal stationery envelope (size F) showing the 'Address Of Sender' boxed instruction on front and with THOS DE LA RUE & CO imprint under flap in fine unused condition. H&G 5. GRENADA - 1951 6c ultramarine RPSE (size F) to UK uprated from SAUTEURS. Unlisted by H&G. 1951 6c ultramarine on cream 'KGVI' registered postal stationery envelope (size F) addressed to UK bearing QEII 1c and 6c 'West Indies Federation' adhesive tied by SAUTEURS/GRENADA cds dated MR.3.59. Unlisted in this size by H&G and a scarce envelope used. GRENADA - 1929 3d dark blue on cream RPSE (size F) with NOTICE on reverse unused. H&G 7. 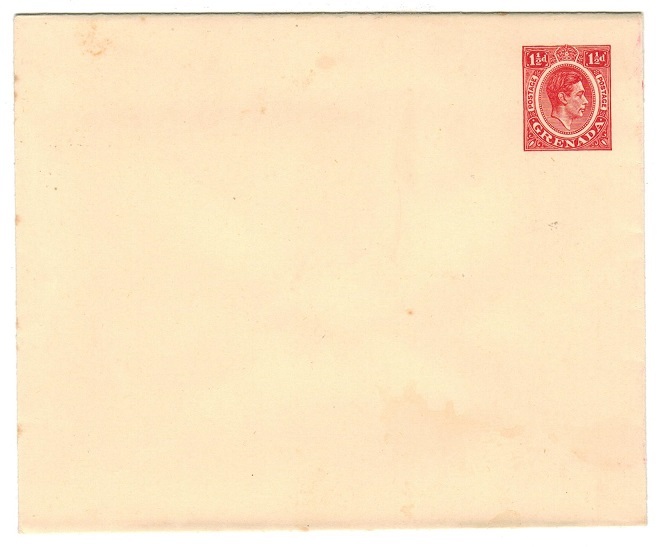 1929 3d dark blue on cream registered postal stationery envelope (size F) with red text and showing THOS DE LA RUE & CO. LTD imprint under flap in fine unused condition. The reverse sides shows the NOTICE for registration fee printed in red. H&G 7. 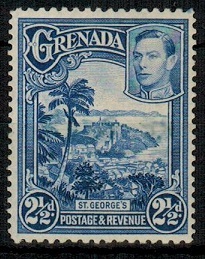 GRENADA - 1929 3d dark blue on cream RPSE (size G) unused. H&G 7a. 1929 3d dark blue on cream registered postal stationery envelope (size G) with red text and showing THOS DE LA RUE & CO. LTD PATENT imprint under flap in fine unused condition. H&G 7a. 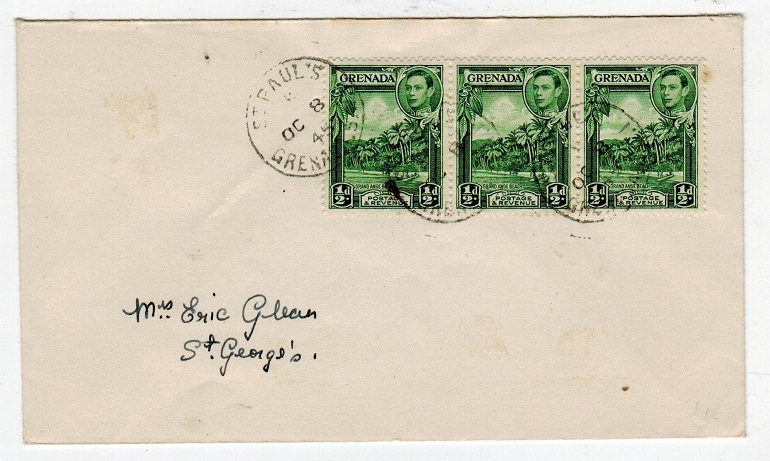 GRENADA - 1949 1c green stationery wrapper used locally with UNCLAIMED and RETOUR h/s's. H&G 13. 1949 1c green on cream postal stationery wrapper addressed locally to Birchgrove cancelled by GPO.GRENADA/BWI cds dated 4.MY.54 but the paper could not be delivered and is struck by UNDELIVERED and two RETOUR handstamps in black. BIRCH GROVE arrival b/s and DEAD LETTER OFFICE strike. H&G 13. GRENADA - 1953 inward 'GB' 6d air letter undelivered with DEAD LETTER OFFICE h/s. 1953 (JY.8.) inward 6d airletter from GB addressed to St.Patricks marked 'Dead' in manuscript and hence struck by DEAD LETTER OFFICE/GRENADA cds and violet boxed UNDELIVERED FOR REASONS STATED/RETURN TO SENDER handstamp. GRENADA - 1951 5c PSE uprated for registration to Jamaica with PRINCESS ALLICE APPEAL h/s. H&G 3. 1951 5c purple on yellowish cream postal stationery envelope registered to Jamaica bearing QEII 3c and 12c adhesives tied GPO/GRENADA dated MR.5.55 with black boxed REGISTERED/No handstamp on the front and GIVE TO THE/PRINCESS ALICE/APPEAL cachet on reverse. H&G 3. GRENADA - 1950 2 1/2d bright blue rare (perf 12 1/2x13 1/2) mint but RE-PERF'd. SG 157a. GRENADA - 1883 4d black on 2/- orange used strip of three. SG 41. 1883 4d black on 2/- orange surcharged adhesive with additional 'Postage' overprint applied in a fine strip of three cancelled by two full strikes of the s/r GRENADA cds dated MY.26.88. SG 41. GRENADA - 1947 registered cover to UK used at VICTORIA. 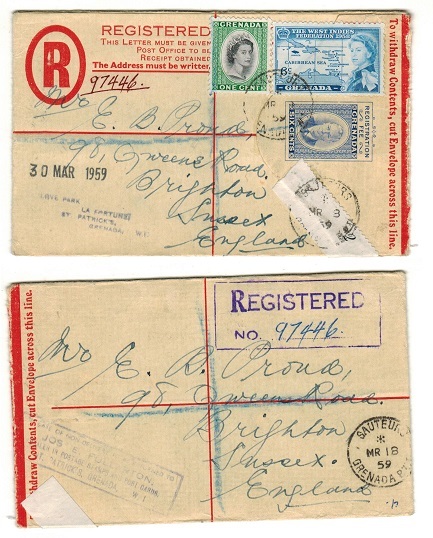 1947 (OC.3) registered cover to UK bearing 1d (SG 154) and Victory pair tied by VICTORIA GRENADA cds with red boxed registered h/s at left. GRENADA - 1947 local cover used at CONCORD. 1947 (My.14) cover addressed locally bearing 1d & 2 1/2d blocks of 4 tied by various neat CONCORD/GRENADA cds's. GRENADA - 1946 (circa) 1 1/2d local cover used at SNUG CORNER. 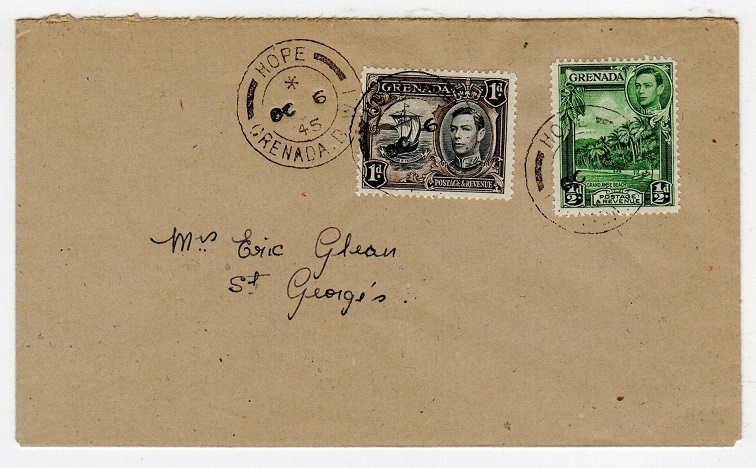 1946 circa cover addressed locally bearing 1 1/2d adhesive (SG 155) tied by SNUG CORNER/ GRENADA cds dated 13.NO. (year slug missing). 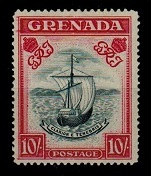 GRENADA - 1951 5c purple PSE unused. H&G 3. 1951 5c purple on cream postal stationery envelope in unused condition. H&G 3. 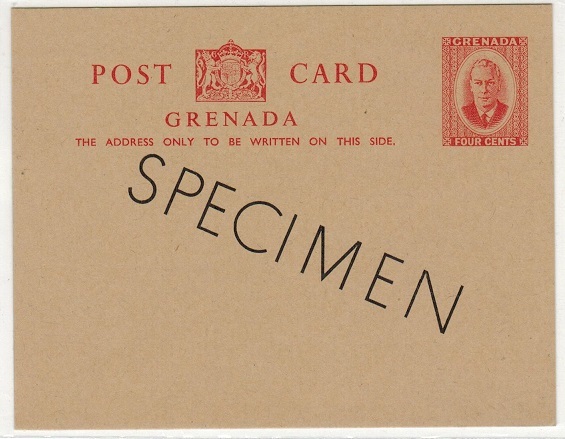 GRENADA - 1938 1/2d green postal stationery wrapper with SPECIMEN overprint. H&G 11. 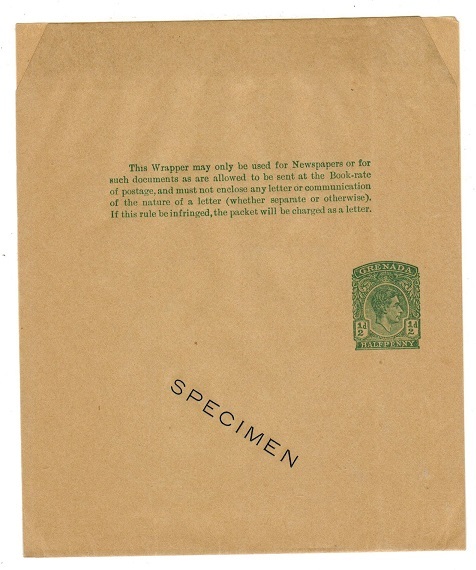 1938 1/2d green on buff postal stationery wrapper in fine unused condition struck by black diagonal SPECIMEN overprint. H&G 11. GRENADA - 1938 1 1/2d carmine PSE overprinted SPECIMEN. H&G 2. 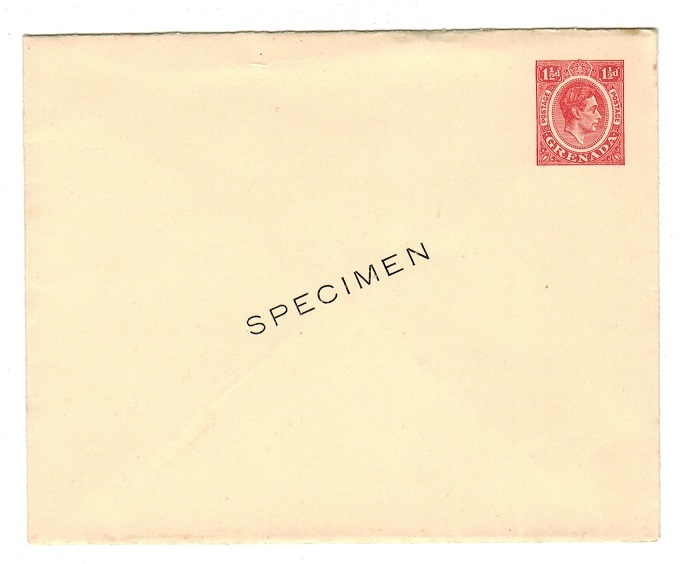 1938 1 1/2d carmine on cream postal stationery envelope in unused condition (few very light small tone spots) struck by black diagonal SPECIMEN overprint. H&G 2. GRENADA - 1938 1d purple PSE overprinted SPECIMEN. H&G 1. 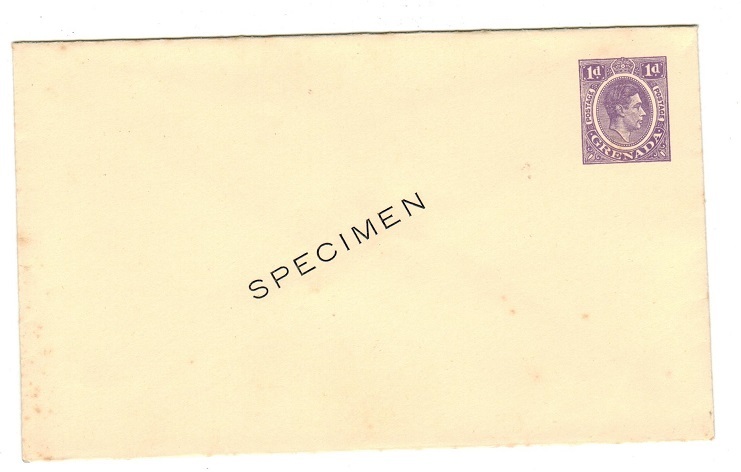 1938 1d purple on cream postal stationery envelope in unused condition (few odd small tone spots) struck diagonally by black SPECIMEN overprint. H&G 1. 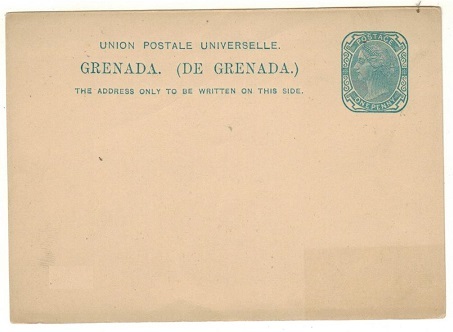 GRENADA - 1884 4d rate entire addressed to UK. 1884 (JA.07.) entire addressed to UK bearing 4d greyish slate (SG 33) adhesive tied by s/r GRENADA cds with red hooded LONDON E.C. arrival b/s. GRENADA - 1951 4d red on buff PSC unused with SPECIMEN diagonally. H&G 17. 1951 4c red on dark buff postal stationery postcard in fine unused condition with black diagonal SPECIMEN on front. H&G 17. GRENADA - 1930 first flight cover to Trinidad. 1930 (JY.20.) first flight cover addressed to Trinidad bearing 1d and 6d adhesives tied GPO/GRENADA with PORT OF SPAIN arrival b/s. Carried by Nyrba with only 221 covers flown. GRENADA - 1887 4d rate cover to USA. 1887 (SP.17.) 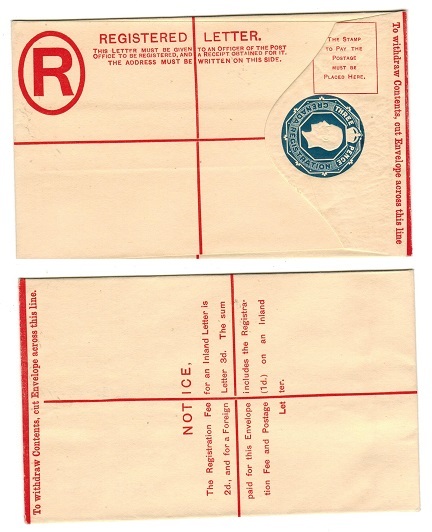 cover addressed to USA bearing 4d greyish slate adhesive (SG 33) tied by s/r GRENADA cds. NEW YORK/PAID ALL/J arrival b/s. 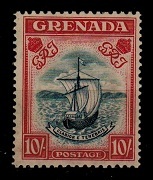 GRENADA - 1901 2d RPSE uprated with 2 1/2d to USA used at ST.GEORGES. H&G 3. 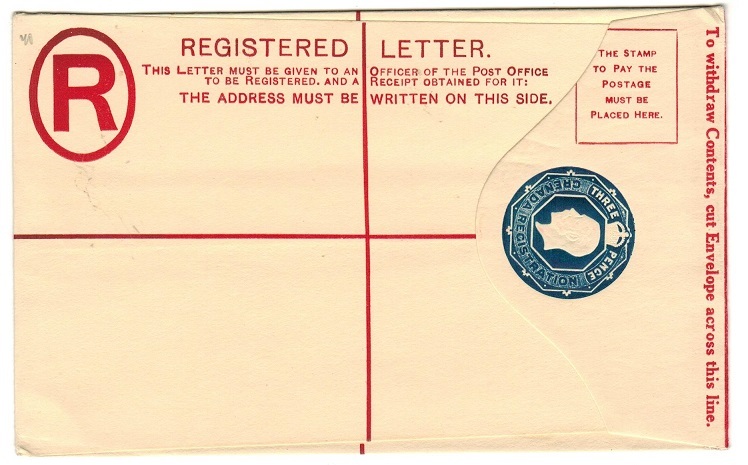 1902 2d blue on cream registered postal stationery envelope (size F) addressed to USA bearing additional 2 1/2d adhesive and tied ST.GEORGES/GRENADA and dated FE.12.03. H&G 3. GRENADA - 1915 1/4d BELGIAN RELIEF FUND label. 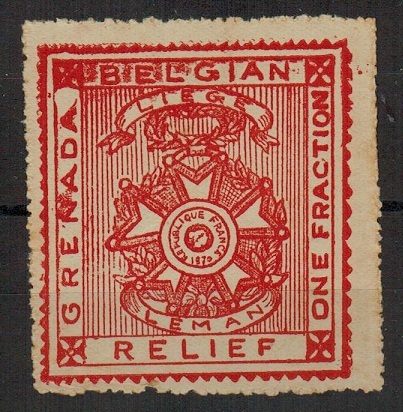 1915 'One Fraction' GRENADA BELGIAN RELIEF label printed in red on gummed paper. A few light tone spots on gummed side otherwise a fine & scarce fund label. GRENADA - 1941 censor cover to USA with rare patriotic label. 1941 (DE.18.) 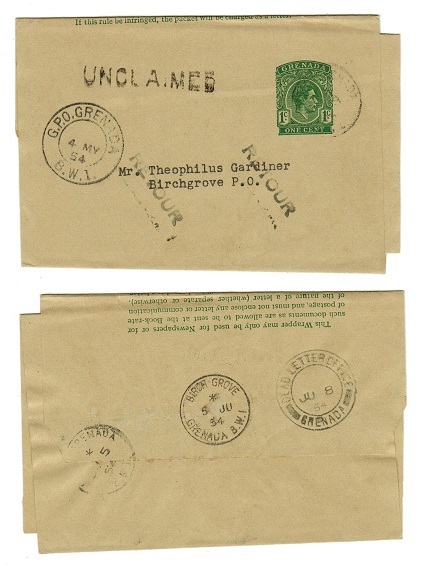 cover addressed to USA bearing 1/4d (x2), 1/2d (x2) and 1d (x2) adhesives tied by ST.GEORGES/GRENADA cds's. The reverse is struck by light red PASSED BY CENSOR handstamp with rare red, white and blue 'rouletted' GRENADA/V/FOR VICTORY patriotic label. Unfortunately there is a heavy vertical fold which affects the left side of the label but this is a rare item of which few examples are recorded. GRENADA - 1906 1d rate postcard to Ireland used at GRENVILLE. 1906 (JA.26.) 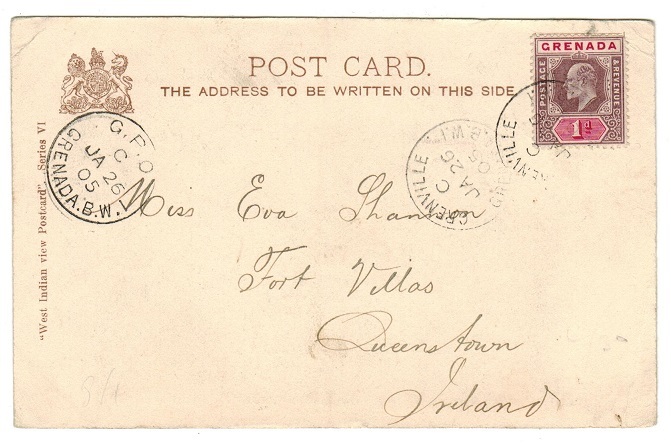 use of picture postcard addressed to Ireland depicting 'A Cacao Planters residence in Trinidad' bearing 1d adhesive tied by GRENVILLE/GRENADA cds with GPO/GRENADA transit at left. GRENADA - 1938 1 1/2d carmine on cream PSE unused. H&G 2. 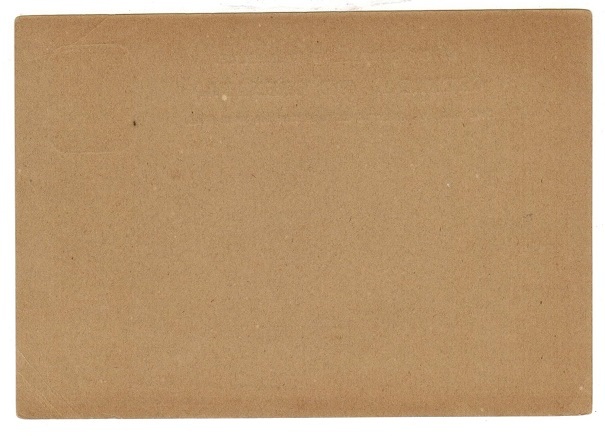 1938 1 1/2d carmine on yellowish woved paper 'KGVI' postal stationery envelope in unused condition. Some very light age marks. Difficult item. H&G 2. GRENADA - 1881 1 1/2d brown on buff PSC unused. H&G 2. 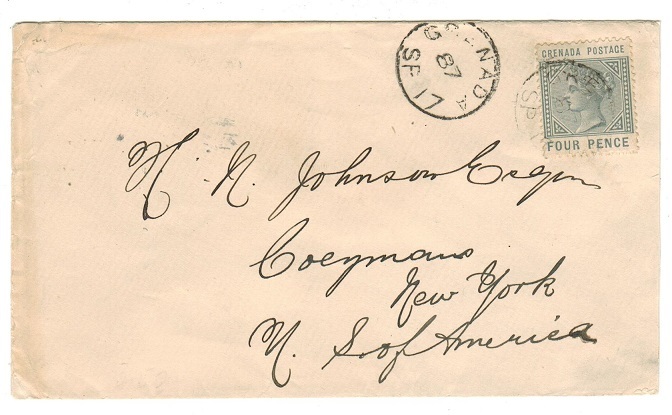 1881 1 1/2d brown on buff postal stationery postcard in unused condition. Somewhat toned reverse side and a few minor faults. A difficult piece of stationery. H&G 2. GRENADA - 1951 6c RPSE (size H2) in unused condition. H&G 11a. 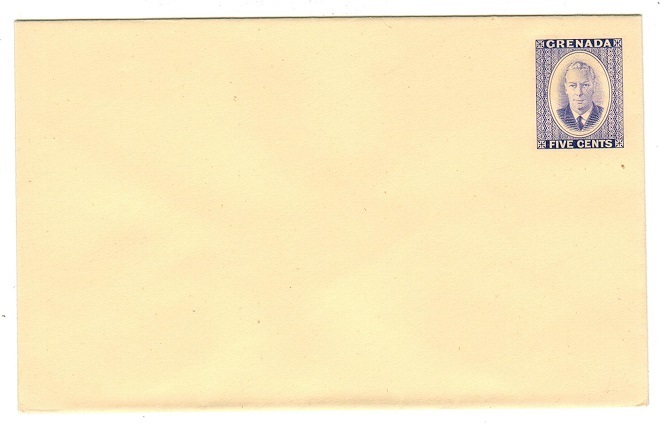 1951 6c ultramarine on buff registered postal stationery envelope (size H2) in fine unused condition. H&G 11a. GRENADA - 1904 postcard to Ireland used at GRENVILLE. 1904 (DE.15.) 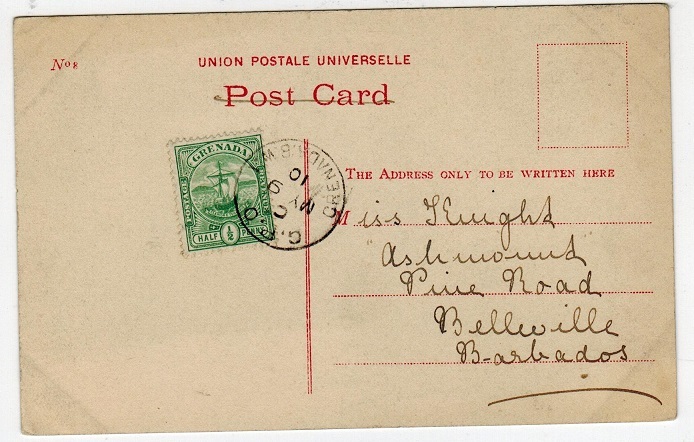 use of picture postcard addressed to Ireland (scarce) depicting 'Outer Carenage, St.Georges' bearing 1/2d adhesive pair tied GRENVILLE/GRENADA BWI with ST.GEORGES transit cds below. 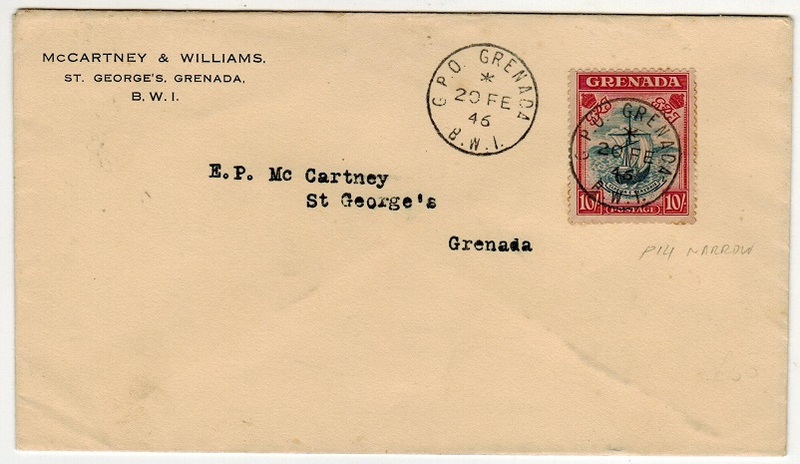 GRENADA - 1919 local unpaid cover with 1d 'Postage Due' added at ST.GEORGES. 1919 (MR.1.) 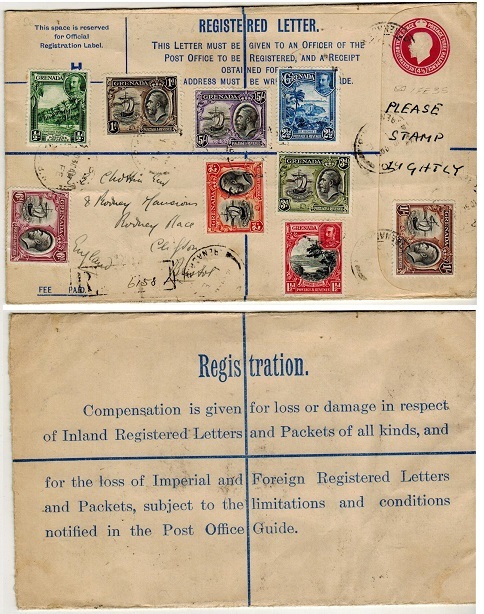 local unpaid cover to St.Georges (a little damage at left edge) struck by GPO/ GRENADA cds with 'T' tax mark applied and a fine marginal PLATE 1 example of the 1d black 'Postage Due' added (SG D8) similarly struck. 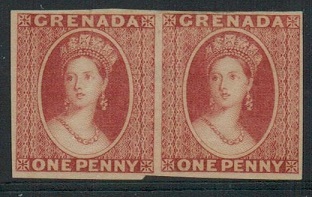 GRENADA - 1861 1d 'chalon' IMPERFORATE PLATE PROOF pair in rose-red. 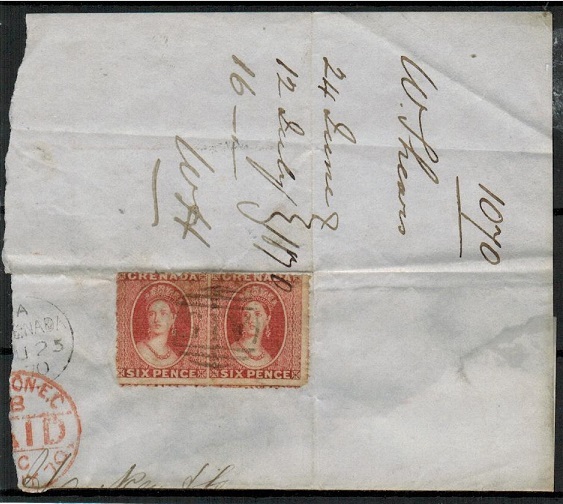 1861 1d (chalon head) IMPERFORATE PLATE PROOF pair (SG type 1) printed in rose-red on ungummed paper. Unissued in this colour. Fine and scarce. 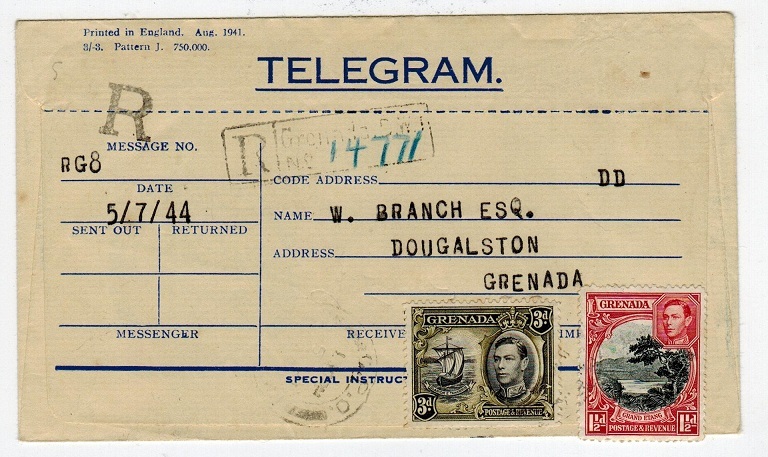 GRENADA - 1945 local cover used at UNION. 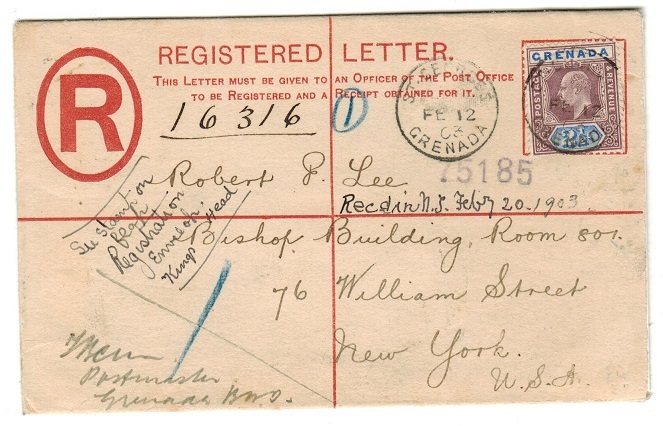 1945 (OC.8) cover addressed locally bearing 1 1/2d adhesive (SG155) tied by UNION/ GRENADA cds. GRENADA - 1945 local cover used at ST.PAULS. 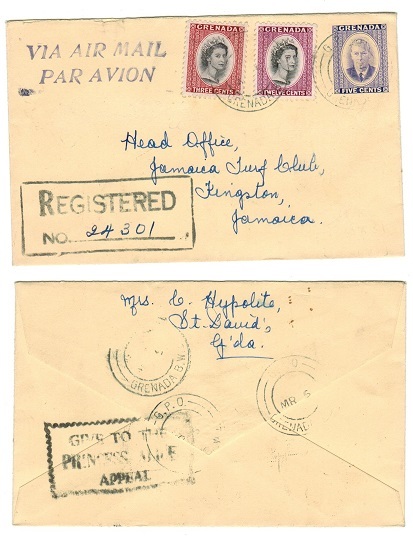 1945 (OC.8) locally addressed cover bearing 1/2d strip of three tied by s/r ST.PAULS/ GRENADA BWI cds's. GRENADA - 1945 local cover used at HOPE. 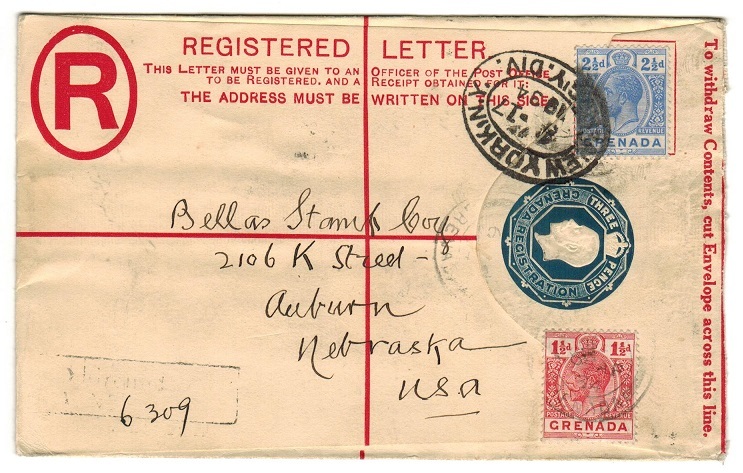 1945 (OC.6) cover addressed locally bearing 1/2d & 1d adhesives (SG153+154) tied by HOPE/GRENADA cds. GRENADA - 1945 local cover used at HERMITAGE. 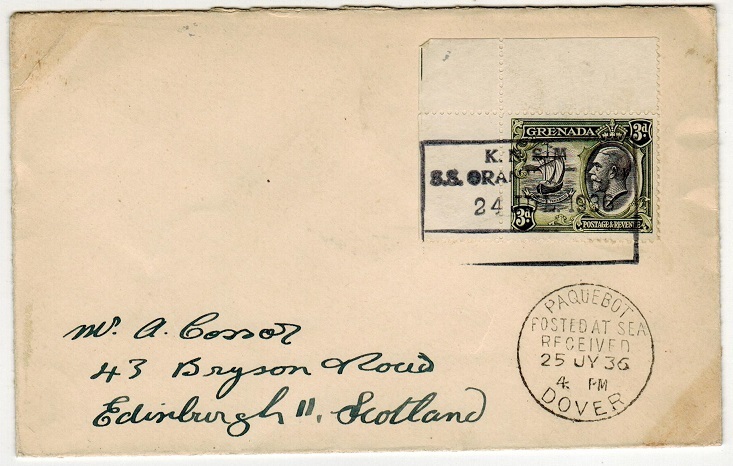 1945 (OC.6) cover addressed locally bearing 1/2d & 1d adhesives (SG153+154) tied by HERMITAGE/GRENADA cds. 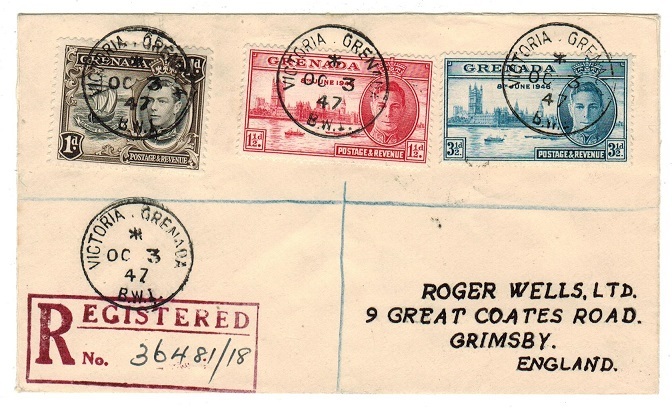 GRENADA - 1945 local cover used at DUNFERMLINE. 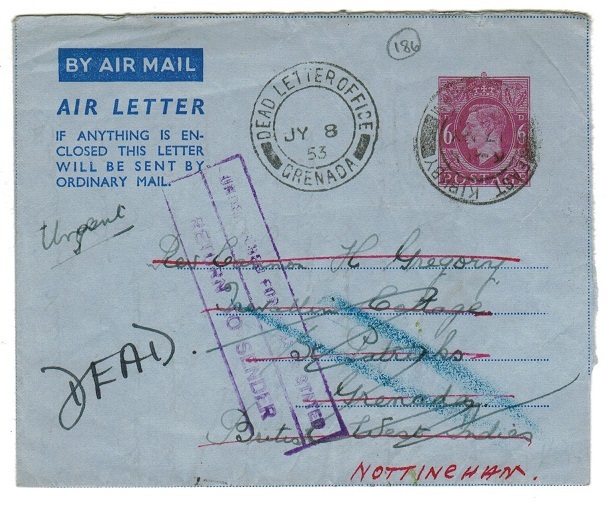 1945 (OC.6) cover addressed locally bearing 1/2d & 1d adhesives tied by s/r DUNFERMLINE/ GRENADA cds's. GRENADA - 1945 local cover used at CROCHU. 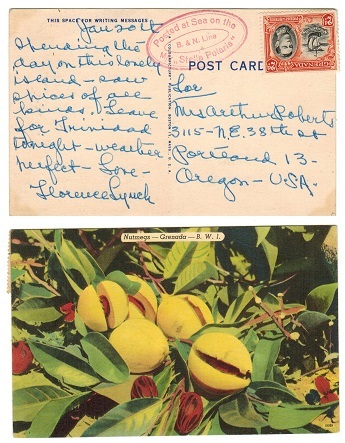 1945 (OC.6) cover addressed locally & bearing 1 1/2d adhesive tied by CROCHU/GRENADA cds. GRENADA - 1945 local cover used at CORINTH. 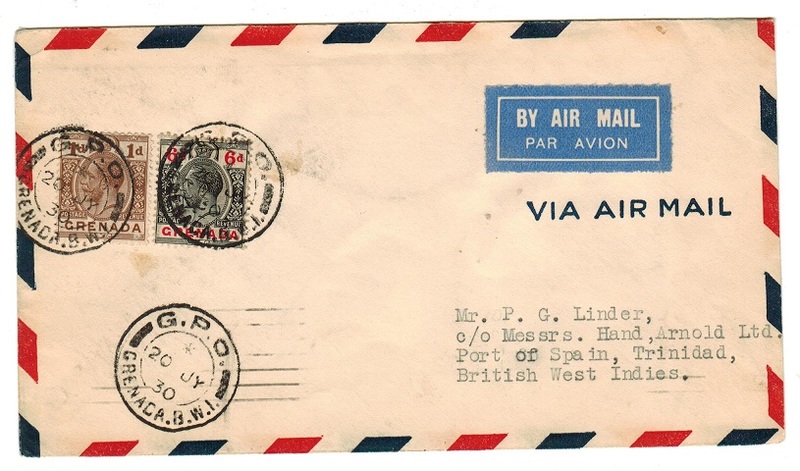 1945 (NO.13) cover addressed locally bearing 1/2d & 1d adhesives tied by scarce CORINTH GRENADA/BWI cds. GRENADA - 1945 local cover used at CONCORD. 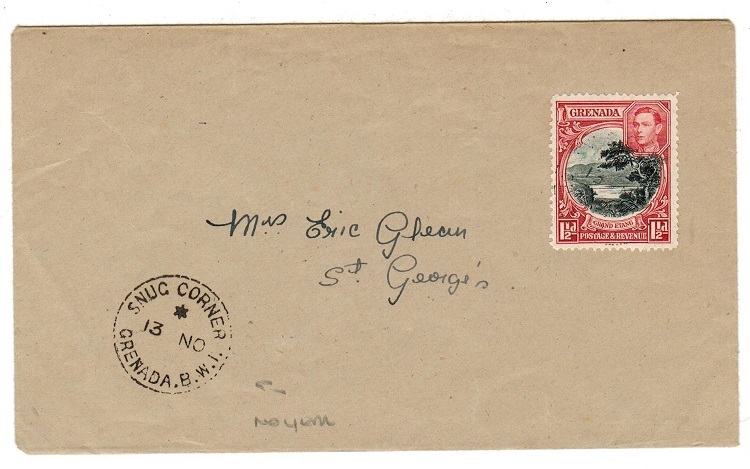 1945 (OC.8) cover addressed locally bearing 1 1/2d adhesive (SG155) tied by CONCORD/ GRENADA cds. GRENADA - 1945 local cover used at BIRCH GROVE. 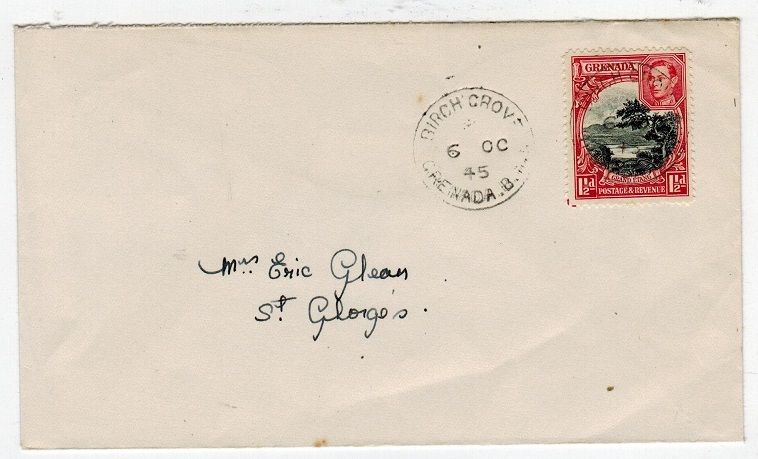 1945 (OC.6) cover addressed locally bearing 1 1/2d adhesive (SG 154) tied by BIRCH GROVE/GRENADA cds. 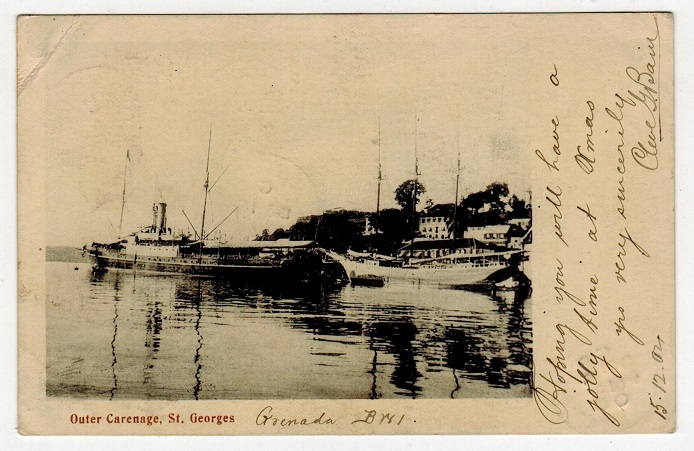 GRENADA - 1910 inter-island 1/2d rate postcard to Barbados. 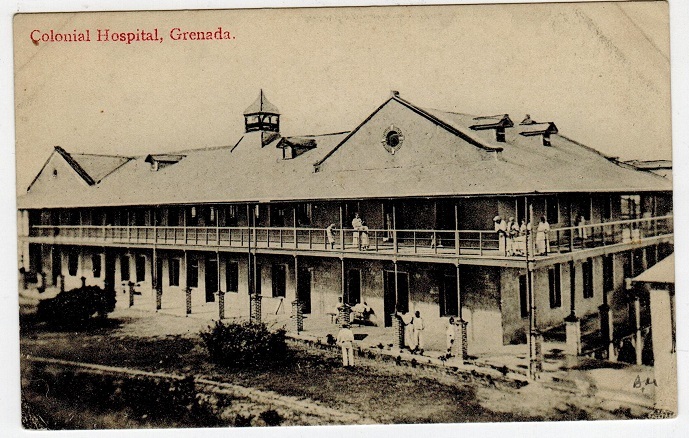 1910 (MY.9) use of picture postcard to Barbados & depicting 'Colonial Hospital, Grenada' & bearing 1/2d (SG 77) tied GPO/GRENADA BWI. A nice inter-island use. 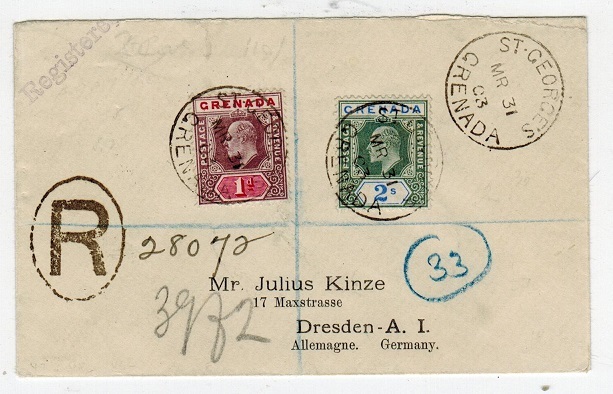 GRENADA - 1903 1d and 2/- adhesive on registered cover to Germany from ST.GEORGES. 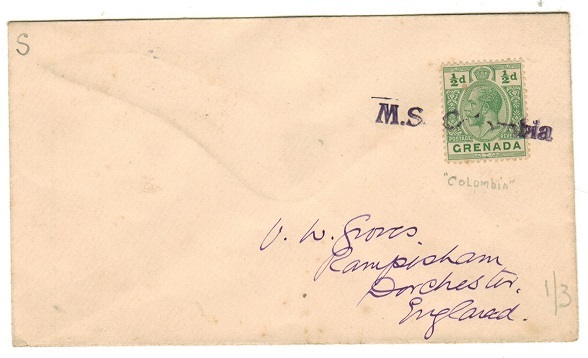 1903 (MR.31) registered cover to Germany bearing 1d & 2/- adhesives (SG 58+64) tied by ST.GEORGES/GRENADA cds. Violet s/l REGISTERED mark & oval 'R' marking at left. 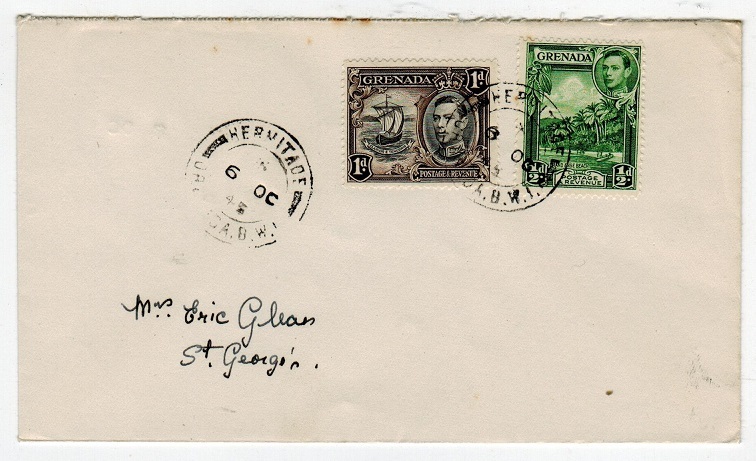 GRENADA - 1899 OHMS cover to Denmark with 'T' tax mark used at ST.GEORGES. 1899 stampless O.H.M.S. 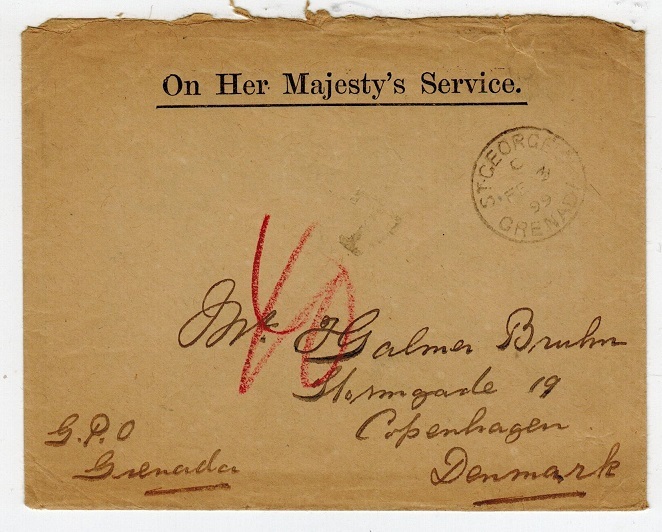 manila envelope (132x105mm) addressed to Denmark cancelled by fine ST.GEORGES/GRENADA cds dated FE.3.99 with 'T' tax mark & manuscript '40' applied in red. 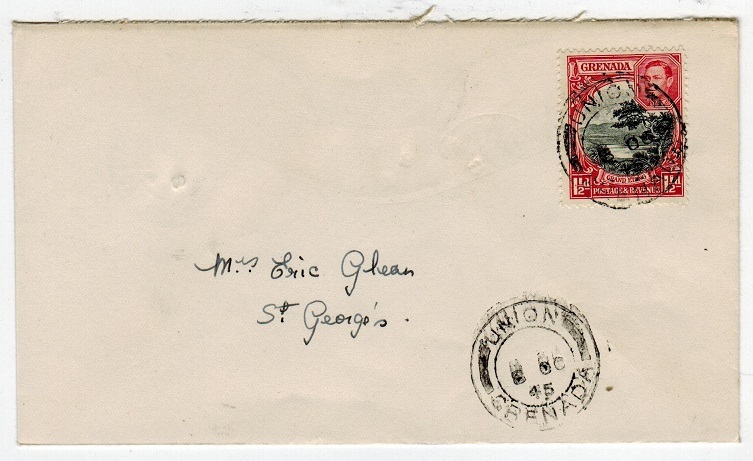 GRENADA - 1899 registered cover to Switzerland. 1899 (OC.12.) 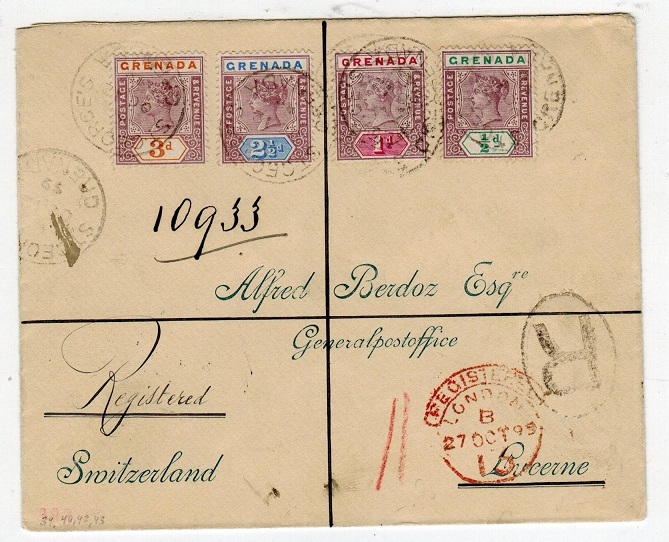 registered cover addressed to Switzerland bearing 1/2d, 1d, 2 1/2d and 3d adhesives (SG 48,49,51+53) tied by ST.GEORGES/GRENADA cds's. GRENADA - 1892 1d/8d surcharge local cover. 1892 (AU.12.) 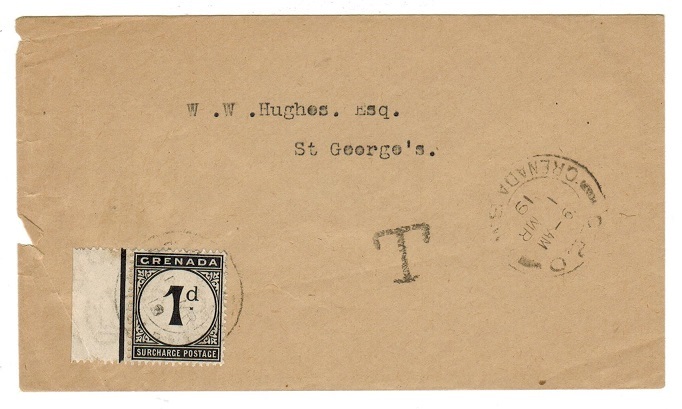 cover addressed locally to St.Georges bearing 1d on 8d grey-brown surcharge adhesive (SG 46) tied by GRENADA cds. A nice use of this stamp on cover. GRENADA - 1949 GRENADA/OFFICIAL PAID/WEIGHT registered OHMS cover to USA. 1949 (FE.12.) 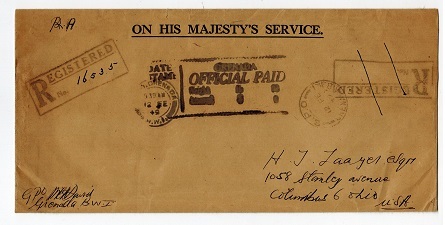 use of long ON HIS MAJESTYS SERVICE stampless envelope registered to USA cancelled by GPO/GRENADA BWI cds and struck by the very rare black boxed GRENADA/OFFICIAL PAID/WEIGHT rubber h/s. (Proud type OPD10). Very few examples recorded. 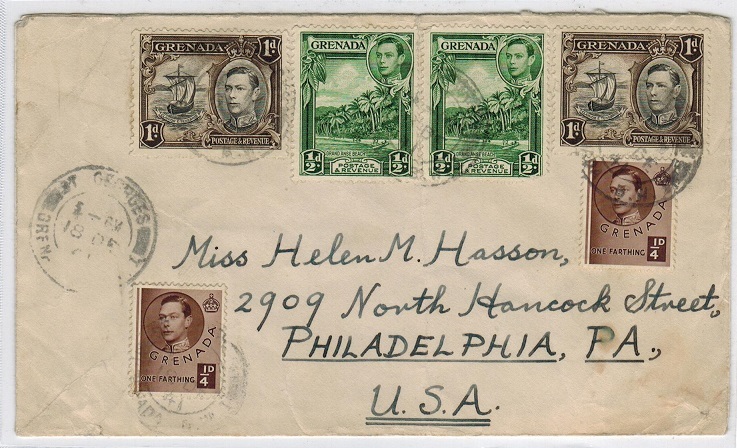 GRENADA - 1932 OFFICIAL PAID h/s on OHMS cover to USA. 1932 (DE.13) use of long pre-printed 'O.H.M.S.' envelope addressed to USA & h/s'd by violet 'Colonial Postmaster' h/s. Struck by s/r OFFICIAL PAID/GRENADA B.W.I. 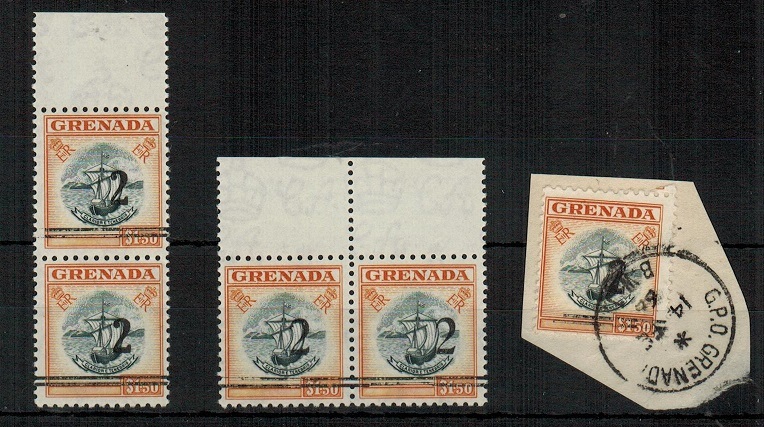 cds dated 13.DE.32 with d/r GPO.GRENADA/BWI cds alongside. 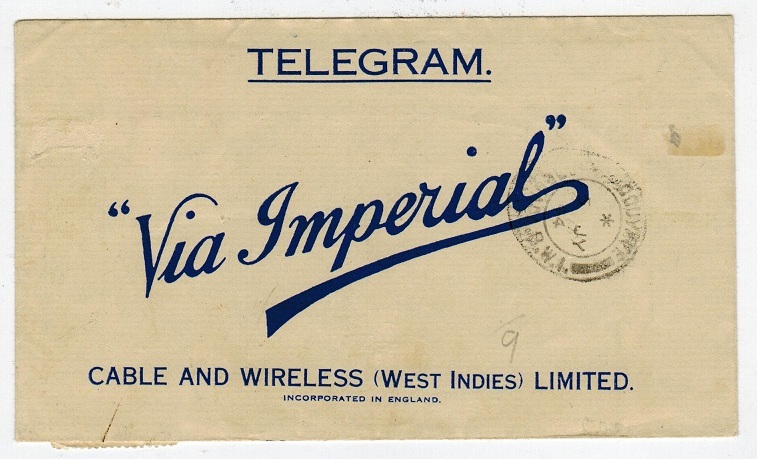 GRENADA - 1944 'Cable and Wireless' TELEGRAM used locally. 1944 (JY.5.) 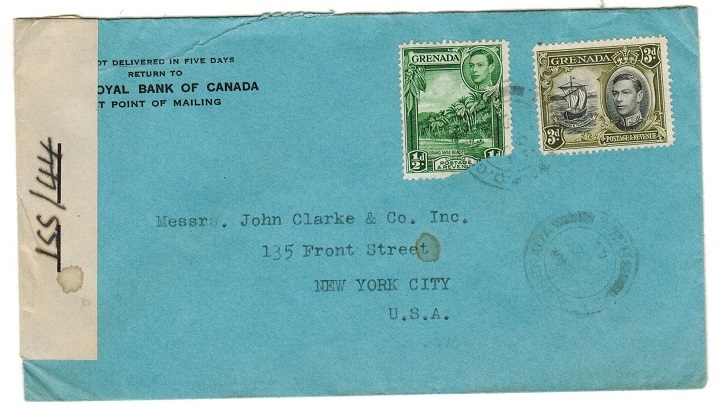 use of 'Cable and Wireless' blue on cream TELEGRAM envelope addressed locally and bearing 1 1/2d and 3d adhesives tied by G.P.O./GRENADA cds with COUYAVE/GRENADA arrival b/s. GRENADA - 1943 10/- Slate blue and bright carmine. Mint. SG 163b. 1943 10/- Slate blue and bright carmine (perf 14) issue with narrow frame in very fine mint condition. SG 163b. GRENADA - 1938 10/- steel blue and carmine. Fine mint. SG 163. 1938 10/- steel blue and carmine (perf 12x13) issue with narrow frame in very fine mint condition with dark brown gum. SG 163. 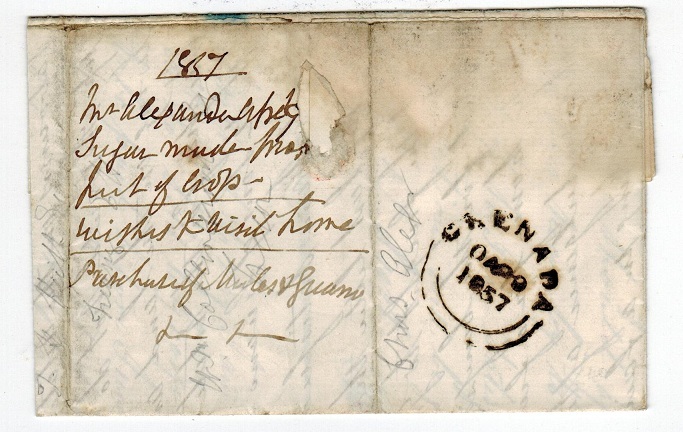 GRENADA - 1857 stampless entire to UK cancelled GRENADA. 1857 entire addressed to UK cancelled on reverse by fine GRENADA fleuron with red LH/ MY.2.1857 marking & green PADDINGTON arrival cds. 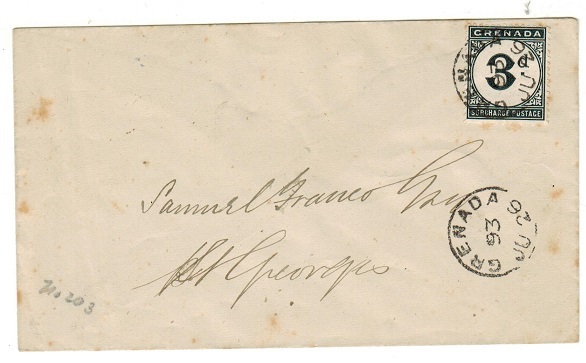 GRENADA - 1843 stampless entire to UK cancelled GRENADA at 1/- rate. 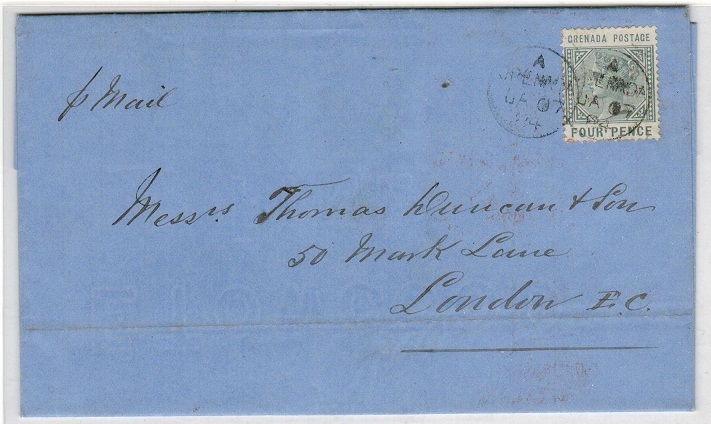 1843 (FE.7) stampless entire addressed to UK & rated in manuscript '1/-' with 'Per Steamer' at bottom left. Backstamped by light double arc type GRENADA h/s. 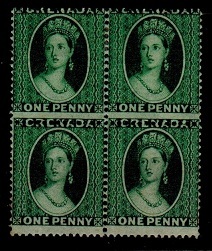 GRENADA - 1875 1d green 'chalon head' mint block of four. SG 14. 1875 1d Green 'chalon head' perf 14 adhesive with large upright star watermark in a fine mint block of four with slightly misplaced perforations to the top. Nice multiple. SG14. GRENADA - 1908 10/- green and red adhesive mint. SG 83. 1908 10/- Green & red on green paper. A very fine mint example. SG83. GRENADA - 1888 4d on 2/- orange surcharge mint. SG 41. 1888-91 4d on 2/- Orange surcharge with 4mm setting in very fine mint condition. SG41. GRENADA - 1886 1d on 4d surcharge fine used. SG 39. 1886 1d on 4d Orange surcharge in very fine used condition. SG 39. GRENADA - 1875 1d mint REVENUE. 1875 1d orange and green REVENUE adhesive in fine mint condition. Barefoot 1. 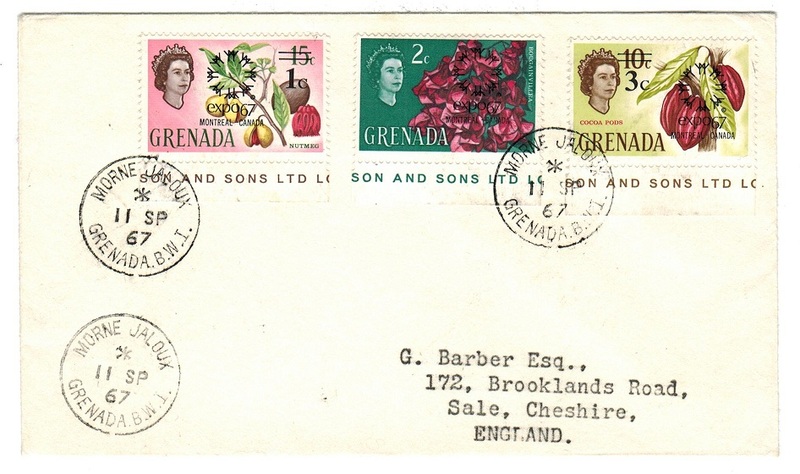 GRENADA - 1967 cover to UK used at PIEDMONTAGNES. 1967 (SP.11.) 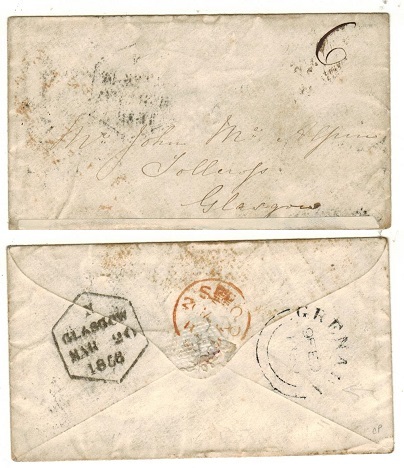 cover addressed to UK bearing 'Expo' trio (SG 257-59) tied by PIEDMONTAGNES cds. 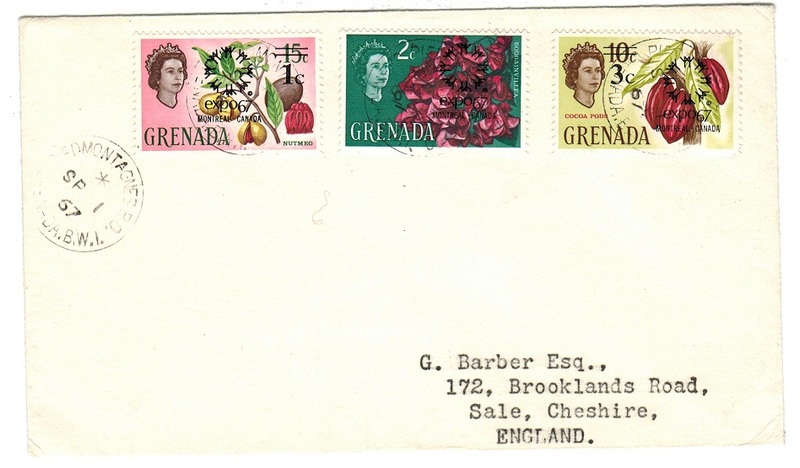 GRENADA - 1967 cover to UK used at MORNE JALOUK. 1967 (SP.11.) 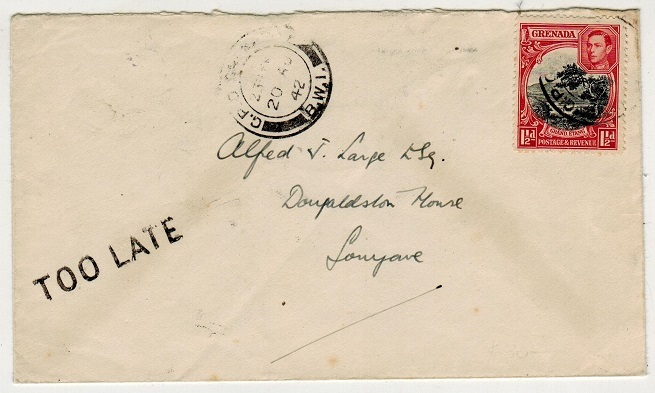 cover addressed to UK bearing 'Expo' trio (SG 257-59) tied by MORNE JALOUK/GRENADA cds.